It’s a pretty simple set of questions. As professionals (and organizations), it seems like we ought to have thought about this before. The first question (what do you do?) can be answered in a very straightforward way (a trucking company, a roofing company, a risk advisor). The second question (why does it matter?) is where it gets a little trickier. Why do you matter to: 1) your clients, 2) your employees, 3) your community? If you really put some thought into this question, it’s incredibly difficult to answer. Back in 2016 at HNI, we spent a lot of time mulling over why we exist. And although we answered the question, it takes a lot more than a sentence to encapsulate what that actually means to: 1) our clients, 2) our employees, 3) our community. How does our purpose come to life on a day-to-day basis? How do we live our purpose (even when we're tempted to take shortcuts)? And how do we evolve in the face of continuous change? To elaborate on these questions in a more concrete way, we decided to write a book. So, in 2017 we released Breaking Free - a handbook for CEOs and Risk Managers on a quest to break-free from insurance dependency. In early 2018 we released Stop The Insanity - a health care survival guide for the C-Suite and HR leaders. Today, we’re releasing the third member of the trilogy (the book we probably should’ve written first). 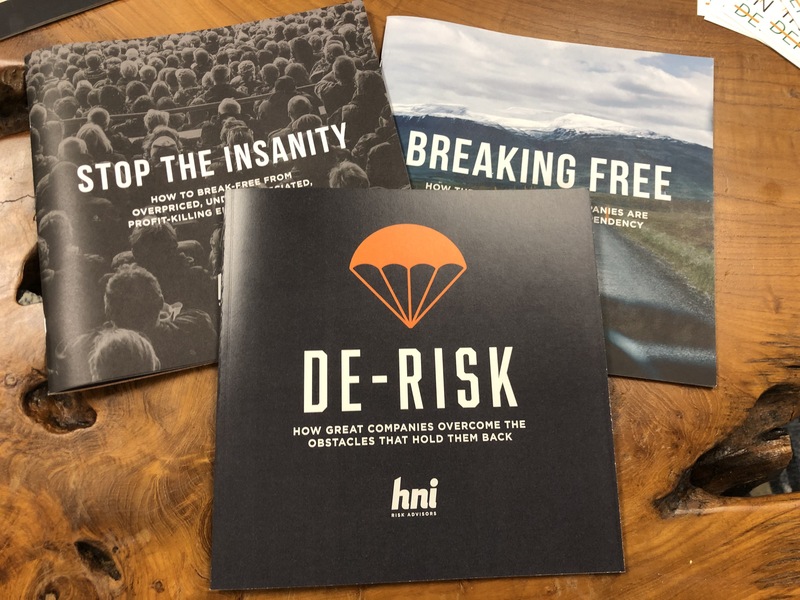 It’s called DE-RISK - an Entrepreneur's guide to driving change. We hope it captures what it means to be a business leader today, what it takes to drive change, and can provide a little inspiration for that journey. The first chapter is available below. If you’d like to request the full book, you can do so here.